Due to increase in consumption coupled with incompetent management is continuously affecting the natural populations of fishes leading to production losses. Conventionally, antibiotics and chemotherapuents have gained importance in treating diseases in aquatic animals (Li and Gatlin, 2005). FAO (2002) stated that few efficacious drugs or antibiotics are available but with increasing problem of emerging drug-resistant pathogens and the resultant food and environmental contamination therefore, disease prevention appears to be a better approach rather than treatment dependence for controlling infectious diseases. Additionally, antibiotics also affect the beneficiary normal microflora of the host digestive tract (Aly et al., 2008). Such increased concern has given impetus for the employment of several alternative husbandry methods for combating or controlling diseases including use of some beneficial microorganisms as probiotic. Schrezenmeir and De Vrese (2001) use the term probiotic for the products that contain viable microorganisms in requisite amount capable of altering the mucosal microbiota by colonizing in the particular organ of the host with beneficiary effects on their health. Probiotics which are available commercially, in case of fish, have considerable low rate of success as most such preparations are based on strains which are isolated from non-fish sources and thus are not able to remain viable/survive at high cell density in the gastro-intestinal environment of the fish (Moriarty, 1996) especially during the active growth phase. Verschuere et al. (2000) suggested that a particular probiotic strain is likely to be more effective in the host species from where it is isolated. Such isolated strains should perform better as having already adhered to the gut wall of the fish and are capable to emulate with pathogens for nutrients. Apparently, strains with ability to develop dominant colonies in the fish intestine are good candidates as probiotics since they may prevent the adhesion of pathogens on the gut wall (Ghosh et al., 2003). Probiotics can be supplied as live supplements in diet, which are competent to survive the passage through the intestinal tract (Fuller, 1992). This study was therefore, taken up with the novel objective of isolation of probiotic bacterial strains from fish intestine of Cirrhinus mrigala and screening them by investigating its probiotic abilities. Following isolation process, bacterial identification and characterization was made by means of both genotypic and phenotypic strategies and supplementation of the selected bacterial strain as a probiotic in the diet of Cirrhinus mrigala to evaluate its effect on their growth performance. The rate of aggregation of bacterial isolates was determined following the method of Re et al. (2000) as modified by Kos et al. (2003). To evaluate the auto aggregation, the selected bacteria were grown in nutrient broth at 37°C for 24 hour. Following the centrifugation at 5000 g for 15 minutes, cells were washed twice and suspended in phosphate buffer saline to attain a possible concentration of about 107-108 CFU ml-1. After mixing for 10 seconds, 4 ml of the cell suspension were incubated at room temperature for 5 hour to determine auto aggregation. Each hour 0.1 ml of upper suspension was transferred by 3.9 ml of phosphate buffer solution, and the optical density was measured at 600 nm. Percentage (%) auto aggregation was calculated by the equation: 1-(At/A0) × 100 where, At represents the absorbance at time t=1, 2, 3, 4 or 5, and A0 the absorbance at t=0. For determining coaggregation, the cell suspension was prepared in a similar manner. 2 ml aliquots of two cell suspensions were mixed together by whirling for 10 second. Along with, about 4 ml of each cell suspension was set aside as control group. After mixing and incubating at room temperature for 5 hour the absorbance was measured at 600 nm. Coaggregation was calculated following Handley et al. (1987): (Ax+Ay)/2–A(x+y)/Ax+Ay/2 × 100, where Ax and Ay represented absorbance of each of the two strains in the control tubes, and (x+y) their mixture. The tolerance to acid was evaluated using a modified method of Conway et al. (1987) and Pennacchia et al. (2004). In a nutrient broth cultures were grown at 37°C for 18 hours. 1 ml of this bacterial suspension was added into 9 ml of sterile phosphate buffer saline solution adjusted to pH 2.5 with 5 N HCl. The bacteria were incubated at 37°C for 0 and 3 hour, representing the time spent by food in stomach; while pH 6.0 served as a control group. Bile salt tolerance was performed following the method of Gilliland et al. (1984). 1 ml of bacterial suspension was transferred into 9 ml of sterile nutrient broth prepared with bile salt. About 0.3% of bile salt concentrate was applied while second culture with 0% bile was used as a control. This suspension was incubated on nutrient agar at 37°C and viable bacteria were counted after exposure of 0 and 4 hour, reflecting the time spent by food in the small intestine. The strain used in this study was isolated from the intestinal tract of healthy Cirrhinus mrigala and identified as Bacillus cereus according to its morphological and biochemical characteristics (Bhatnagar and Lamba, 2015). The isolate showed the maximum inhibition (20 mm in diameter) against the pathogenic strain among all other isolated bacterial strains hence was selected for the study. Further, molecular characterization was done with the isolation of 16s rDNA. DNA for the identification was isolated from the culture. Next, the quality was checked on 1.2% agarose gel where a single band of high-molecular weight DNA was obtained. From the above isolated DNA fragment of 16S rDNA, gene was amplified by PCR (Figure 1). When resolved on agarose gel, a single discrete PCR amplicon band of 1500 bp was observed which was purified to remove any contaminants. Using BDT v3.1 Cycle sequencing kit on ABI 3730xl Genetic Analyzer forward and reverse DNA sequencing reaction of PCR amplicon was carried out with 8F and 1492R primers. From forward and reverse sequence data consensus sequence of 1334 bp 16S rDNA gene was generated with help of aligner software. This 16S rDNA gene sequence was used to carry out BLAST with the nr database of NCBI gene bank database. The multiple alignment software programs Clustal W was used to align the top 10 sequences which were selected based on maximum identity score. Distance matrix was generated using RDP database and with MEGA4 a phylogenetic tree was plotted. Figure 1: Gel Image of 16SrDNA amplicon. Lane 1 showing DNA marker. Lane 2 representing amplicon band of 16S rDNA. Four different types of feeds were prepared for the experimental trial. In treatment TC (control), fishes were fed on control diet (Ingredient composition in kg g-1, ground nut oil cake 650; rice bran 42; hydrothermically processed soybean 266; wheat flour 32; mineral mixture 10). While for the treatment T1, T2 and T3, the diets were supplemented with live probiotic bacterium B. cereus isolated from the gut of C. mrigala fingerlings. Isolated bacteria was mass cultured for 48 hours, centrifuged at 5000 rpm for 15 minutes and washed thrice with 1% Sodium chloride solution. The culture was further resuspended in sterile saline solution and added to feed in the proportion of 2 × 104, 2 × 105 and 2 × 106 cells 100 g-1 of feed. The feed was spread in the sterile tray and the absorption was achieved by spraying the probiotic bacterium B. cereus, air dried and finally stored in vacuum sealed plastic containers at 4°C for the whole trial period. The concentration of bacteria in the diets was checked after 90 days. Fingerlings of C. mrigala with average weight 1.6 ± 0.02 g were used for the feeding trial experiment. Fingerlings were kept in plastic tubs of 30 L capacity in laboratory conditions, maintaining the optimum temperature conditions. Fishes were acclimatized for 10 days prior to experiment start. Chlorine free water was used for the experiment. In order to monitor the growth, groups of fingerlings in triplicate were sampled from each tub at 15 days interval (20 fingerlings per tube). In all treatments fishes were fed for 90 days with respective diets daily at 4% body weight in two installments at 8:00 and 16:30 hours maintaining constant aeration and daily two-thirds water exchange. Standard methods of the Association of Official Analytical Chemists (1995) were followed to determine the proximate analysis of experimental diets and fish carcass (initial and final). The intact pellets were picked up by tube dropper or siphon pipe and dried in oven in a petridish to calculate the chromic oxide levels in the diets as well as in the faecal samples spectrophotometrically (Furukawa and Tuskahara, 1966). Apparent protein digestibility (APD) according to the methods of Cho et al. (1982) was calculated for the diets. Standard method of Steffens (1989) were followed to determine live weight gain (g), percent weight gain, specific growth rate, feed consumption per day in percentage of body weight, feed conversion ratio (FCR), gross conversion efficiency (GCE), and protein efficiency ratio (GER). To determination the enzyme activity of protease (Walter, 1984), amylase (Sawhney and Singh, 2000), and cellulase (Sadasivam and Manickam, 1996), six fish were randomly sampled from each treatment at the termination of experiment. During the feeding trial, the water samples from all the experimental tubs were collected fortnightly to analyze temperature, dissolved oxygen (DO), pH, electrical conductivity, calcium, chlorides and total alkalinity following APHA (1998) to inspect the influence of compounded feeds on quality of holding water. Post prandial excretory levels of total ammonia (N-NH4+) and reactive orthophosphate were estimated following the American Public Health Association (1998), and calculated following Sumagaysay-Chavoso (2003). Kaplan-Meier survivorship curve was prepared on MSExcel to show the trend during challenge trial with Aeromonars hydrophila for ten days (Kaplan and Meier, 1958). The significant differences among dietary treatments was calculated with ANOVA followed by Tukey’s test (Tukey, 1977) at a probability value of P<0.05. The statistical tests were measured using SPSS Version 11.5 for Windows. The prokaryotic rDNA genes contain highly conserved sequences. The potential utility of conserved regions to identify or amplify the rDNA gene followed by exploitation of more variable regions of the gene spacers to detect or identify bacteria is currently in practice (Berry et al., 1990). Similar method was employed in the study of identification of the culture which was labelled as CM2. Based on phylogenetic analysis and nucleotide homology it was found to be similar to Bacillus cereus strain SL1 (GenBank Accession Number: FJ627945.1). A blast search of the database indicated a close genetic relationship to other isolates of Bacillus cereus. The phylogenetic tree was plotted using Phylp 3.69 software and tree (phylogram) visualization was done by TreeViewX (Figure 2). Partial 16S rDNA gene sequence data analysis of strain CM2 showed high arrangements between traditional and molecular identification as established by traditional characterization earlier (Bhatnagar and Lamba, 2015), and the isolate was finally identified as Bacillus cereus strain SL1. However, distinguishing between toxic wild-type Bacillus cereus strains and this probiotic strain is crucial to assess the quality and possible hazard of feed. There is no evidence that isolated Bacillus cereus strain SL1 when supplemented in diet has any harmful effect on C. mrigala fingerlings since the feed supplementation resulted in complete absence of any disease or abnormality in the experimental fingerlings. The probiotic property of antagonism was confirmed by the results demonstrating the inhibitory effect against Aeromonas hydrophila. Here we observed a strong antibacterial activity of B. cereus strain SL1 showing the maximum inhibition (20 mm in diameter) against the pathogenic strain Aeromonas hydrophila, when performed by well diffusion assay which are not seen for wild-type strains (Bhatnagar and Lamba, 2015). Figure 2: Phylogenetic tree of the Bacillus strain showing evolutionary relationships of 11 taxa. Further, the characteristic properties of probiotic such as cell surface hydrophobicity, tolerance to acid and bile salts, autoaggregation and coaggregation were investigated for the isolate. The cell surface hydrophobicity using xylene and toluene for Bacillus cerus are shown in Table 1. The hydrophobicity was 32.28 ± 2.36% in xylene and 38.72 ± 5.01% in toluene. The aggregation rate of Bacillus cereus was calculated for a period of 5 hour. Initially, the percentage of autoaggregation observed was 15.31 ± 6.58% which increased up to 3 hour. At the termination; 5 hour after incubation, the autoaggregation observed was 39.71 ± 4.3. One of the important criterions for selecting a probiotic strain is its ability to aggregate and to adhere to epithelial cells since it is required for colonization in the intestine and may have a practical use in assisting the choice of bacteria. The nonspecific and specific adhesion of bacteria to cell surfaces may be influenced by the physicochemical characteristics of the cell surface (Smit and Stacey, 1990). The composition, structure and forces of interaction related to bacterial adhesion to intestinal epithelial cells have been investigated by several workers and obtained a relation between cell adherence and its close interaction with undesirable bacteria (Boris et al., 1997; Re et al., 2000; Ehrmann et al., 2002). Surface hydrophobicity examined in the present study illustrate probable interrelation between the physico-chemical property of test strain and their ability to adhere to the intestinal mucus as proposed by Wadstrom et al., 1987. The present result showed a high percentage of B. cereus cells adhered to xylene, an apolar solvent and toluene which demonstrate hydrophobic cell surface property of this strain. Similar results were reported by Kos et al., 2003 and Sansawat and Thirabunyanon, 2009. For determining interbacterial adherence, a coaggregation assay was performed to evaluate the close interaction between candidate probiotic strain and pathogenic bacteria (Collado, 2007; Soleimani, 2010) in which probiotic have a chance to release antimicrobial substances in a very close adjacency. The selected isolate B. cereus displayed desirable coaggregation ability (Table 1) exhibiting that inhibitor produced by it may constitute an important host protective mechanism against infection by forming coaggregate with pathogens (Sansawat and Thirabunyanon, 2009). All values are Mean ± S.E of mean. Table 1: Bacillus cereus showing adhesion property evaluated by different testing methods: hydrophobicity, autoaggregation and coaggregation. Also, the putative probiotic isolated from the gastrointestinal tract must be able to survive the acidic conditions in the stomach and resist bile acids at the beginning of the small intestine to exert their beneficial effect on the host (Klaenhammer and Kullen, 1999; Holzapfel et al., 1998). In our study, the effect of pH (2.5) and bile (0.3%) on Bacillus cereus was evaluated to determine the number of viable cells and survival percentage (Tables 2-4). The viable count was 6.13 ± 0.23 log cfu ml-1 with 85.93% survival after exposure to low pH for 3 hour. The nutrient broth containing 0.3% bile salt showed optimum growth of strain after 4 hour incubation suggesting a high degree of tolerance with 6.49 ± 0.03 log cfu ml-1 viable colonies count and survival rate of 93.49%. Such resistance to bile salts and simulated gastric conditions (low pH) were also shown by studies of Duc et al. (2004); Sansawat and Thirabunyanon, 2009; Hassanzadazar et al. (2012). Such results confirm the selection of acid and bile tolerant strain assuring its high chances of survival passage through the gastrointestinal tract and establishing them in the host intestinal environment. Also, selected strain represented a strong autoaggregating ability which was not lost after washing and suspending of the cells in PBS. Table 2: Viability of Bacillus cereus strain at different pH. Table 3: Viability of Bacillus cereus strain on different bile salt concentrations. Table 4: The proximate composition analysis (% dry weight basis) of experimental diet. Bacillus cereus has been known to be used as probiotics in farmed animals such as swine, calves, poultry and rabbits as well as human use (Hong et al., 2005). Recently, B. cereus has been studied for its probiotic action in Cyprinus carpio (Lalloo et al., 2007), Red Tilapia (Bernard et al., 2012) and Silver catfish (Moreira et al., 2012). However, the optimum number of probiotics could be limiting factor for achieving best payoff in any host (Kishi et al., 1996; Donnet-Hughes et al., 1999). It is said that optimum concentration of probiotics is recommended for establishment and subsequent proliferation in the gastrointestinal tract along with other favorable outcomes such as immunomodulatory activity which may vary with respect to host. Nikoskelainen et al. (2001) reported a high percentage of mortality in Oncorhynchus mykiss when fed at high dose of Lactobacillus rhamnosus (1012 CFU g-1 feed), compared with lower dose (109 CFU g-1 feed). Bhatnagar et al. (2012) recorded that the potent dose of the probiotic Bacillus coagulans must be 2 × 105 cells which in their study resulted in significantly (P<0.05) highest growth performance and survival in Catla catla. Bandyopadhyay and Das Mohapatra (2009) also reported similar results using Bacillus sp. as probiotics in C. catla. Table 5 represents the growth responses and intestinal enzyme activities of test fish fed on experimental diets (TC to T3). It was observed that fish satisfactorily accepted the experimental diet from the beginning of the experiment and maintained normal behavior throughout the experimental period. The survival was high in all dietary treatments during the feeding trial and slight mortality was observed only during the initial days of experiment. The growth parameters such as live weight gain (g), growth/ day in percentage body weight and specific growth rate (SGR) were significantly (P<0.05) high in treatment T2 where fishes were fed on diet containing probiotics (Bacillus cereus), in proportion of 2 × 105 cells 100 g-1 (i.e. 2000 cells g-1) of feed in comparison to dietary treatments TC, T1 and T3. Apparent protein digestibility (APD) and gross conversion efficiency (GCE) were higher in treatment T2 fed fishes whereas significantly (P<0.05) lower values (2.14 ± 0.02) of feed conversion ratio (FCR) were observed when compared with values of treatment TC (2.98 ± 0.03) i.e. diet without probiotics followed by T1 and T3. Intestinal digestive enzyme activities revealed that specific activities of digestive enzymes was significantly (P<0.05) high in all the dietary treatments in comparison to control. Also, the growth parameters showed an increasing trend from treatment TC to T2 (supplemented with probiotics B. cereus in proportion of 0.2 × 104 and 2 × 105 cells 100 g-1 of feed) thereafter, with further increase in the inclusion level of probiotic bacteria in diet T3 (containing probiotics B. cereus in proportion of 2 × 106 cells 100 g-1 of feed) the values decreased. Similar results of improved growth promotion after incorporation of probiotics were observed by Swain et al. (1996) and Ghosh et al. (2003) and Bhatnagar and Raparia (2014) in Indian carps. According to Ueberschar (1993), digestive enzyme activity can be used as an indicator of food acceptance and may serve as an indicator for the digestive capacity in relation to the type of feed offered. Phillips (1969) stated that the digestive capabilities of the fish determine the nutritional value of the diet which in turn is influenced by the activity of the digestive enzymes present in the digestive tract. It was observed that initially up to 15 days no significant variations were observed in the weight gain of group of fishes fed varying dietary treatments. However, thereafter growth rate increased significantly (P<0.05) in the fishes fed diet containing probiotics B. cereus up to 90 days of feeding trial (Figure 3). Means with different letters in the same row are significantly (P<0.05) different. (Data were analysed by Tukey’s test). Table 5: Growth performance and intestinal enzyme activities of C. mrigala fed on diets having different supplementaion of Bacillus cereus. Figure 3: Effect of probiotic bacterium Bacillus cereus supplementation in diet for 90 days of feeding trial on increase in mean fish weight (g) ± S.E of mean of Cirrhinus mrigala fingerlings. Results of this study also showed significantly (P<0.05) high accumulation of carcass protein and energy and low percentage of moisture in probiotic containing diet in comparison to fishes fed on control diet. Initial and final carcass composition of test fish is shown in Table 6. Crude protein (%) was found to be significantly, (P<0.05) higher (14.56 ± 0.16) and ash (%) was found to be significantly (P<0.05) lower in fish fed with diet T2 (containing probiotic Bacillus cereus in proportion of 2 × 105 cells 100 g-1. However, no significant variation was found in nitrogen free extract (%) and crude fat (%) between treatments. Lower ash contents in probiotic supplemented diets indicate the better nutritional quality in fish with addition of probiotics in diet. The probiotics supplementation might have resulted in complementary reduction of antimicrobial compounds leading to improvement in appetite thus, better feed utilization and high carcass composition. Similar effects have been reported for Labeo rohita (Tewary and Bidhan, 2011) and Catla catla (Bhatnagar et al., 2012; Bhatnagar and Raparia, 2014) and Labeo rohita (Tewary and Bidhan, 2011). Table 6: Initial and final proximate carcass composition of Cirrhinus mrigala fed on diets with different proportions of Bacillus cereus as probiotic. Intensification in aquaculture practice leads to deterioration of water quality primarily because of accumulation of metabolic wastes. The data of water quality characteristics related to all treatments observed during 90 days feeding trial of Cirrhinus mrigala is presented in Table 7. The relation of most water quality parameters do not followed any specific trend. The dissolved oxygen (DO) fluctuated between 7.06 ± 0.08 and 6.6 ± 0.09, pH remained alkaline (7.68 ± 0.04 and 7.79 ± 0.02). Conductivity, alkalinity, calcium and chloride varied between 613.3 ± 1.04 and 663.2 ± 1.75; 170.6 ± 0.43 and 152 ± 0.91; 20.46 ± 0.28 and 26.21 ± 0.26, 32.5 ± 0.62 and 37.1 ± 1.7 respectively. Among the treatments, no significant variations were observed in these parameters and were found to be in optimal ranges. However, significantly (P<0.05) low values in total ammonia excretion and reactive phosphate production (mg Kg-1 BW d-1) were recorded in fish fed on diet T2 i.e. B. cereus supplemented diet with 2 × 105 cells 100 g-1 of feed as compared to all other experimental diets (Table 7). Peak level of ammonia excretion observed approximately 6 hour after feed was given to fish and second peak at 12 hour post feeding while o-PO4 (orthophosphate) production showed an initial high level at 4 hour post feeding and second peak at 10 hour post feeding (Figure 4a and 4b). Possibly high digestive enzyme activities in the group of fish fed on probiotic supplemented diet may have resulted in more feed utilization hence contributing the decrease in level of metabolites N-NH4 and o-PO4 in the holding water. Bhatnagar et al. (2012) and Raparia amd Bhatnagar (2016) have also reported significantly lower total ammonia excretion and total phosphate production in the group of Catla catla fed on potential probiotic Bacillus coagulans. Similar results indicating reduction in the the concentrations of nitrogen and phosphorus in pond water compared with the control were reported by Wang et al. (2005) supporting the present results and advocating the use of gut isolated probiotics as feed additives. All values are Mean ± S.E of mean. Means with different letters in the same row are significantly (P<0.05) different (Data were analysed by Tukey’s test). Table 7: Effect of fish feed with different proportion of probiotic bacterium Bacillus cereus supplementation on water quality characteristics. Figure 4: Excretory patterns of orthophosphate (4a) and total ammonia (4b), (mg/Kg Body weight of fish) observed post prandial in holding water for fish Cirrhinus mrigala fingerlings after 90 days of feeding trial when fed on diet supplemented with varying proportions of probiotic bacterium B. cereus. The results of challenge trial post 90 days of feeding trial with pathogenic Aeromonas hydrophila for 10 days to calculate relative percentage survival is presented in Table 8. After 10 days significantly (P<0.05) highest (63.3 ± 5.7%) mortality was observed in diet TC i.e. control fed fishes whereas lowest (6.6 ± 5.7) in diet T2 fed fishes. The survival Kaplan-Meier plots Berwick et al. 2004) for survival of fish after challenge trial are presented in Figure 5 indicating that there is a significant difference between the survival curves in each treatment. The curves displayed that initially after challenge mortality was observed in all groups however thereafter probiotic treated groups showed high survival while number of fishes declined in groups fed on control diets without probiotic supplementation revealing the immunostimulating effects of dietary probiotic supplementation. Earlier studies showed that dietary supplementation of probiotic bacteria significantly increases the disease resistances in Oncorhynchus mykiss (Panigrahi et al., 2005), Catla catla (Bandyopadhyay and Das Mohapatra, 2009), Labeo rohita (Nayak et al., 2007; Kumar et al., 2008), Oreochromis niloticus (Aly et al., 2008). The ability of probiotic bacteria to out-compete other bacteria for nutrients and space as well excluding other bacteria through metabolite production might have resulted in higher survival of fish (Verschuere et al., 2000). Means with different letters in the same column are significantly (P<0.05) different. (Data were analysed by Tukey’s test). Table 8: Percentage mortality and relative Percent Survival (RPS) of Cirrhinus mrigala after a challenge trial of 10 days with Aeromonas hydrophila. 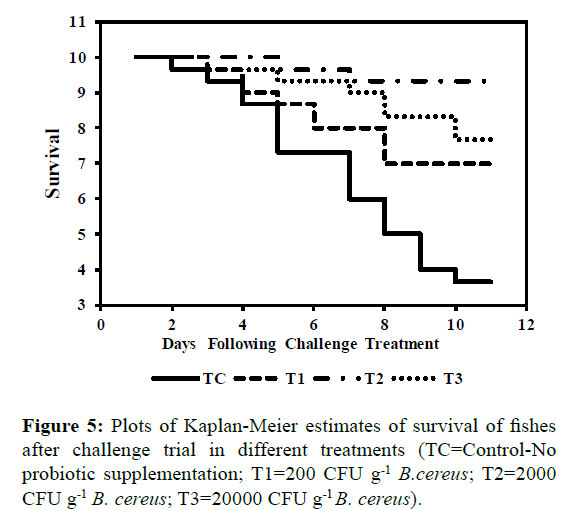 Figure 5: Plots of Kaplan-Meier estimates of survival of fishes after challenge trial in different treatments (TC=Control-No probiotic supplementation; T1=200 CFU g-1 B.cereus; T2=2000 CFU g-1 B. cereus; T3=20000 CFU g-1 B. cereus). Our data suggest that the isolated probiont, Bacillus cereus strain SL1, when compounded with feed, improved the growth performance, feed utilization and digestive enzyme activities. This study considered different probiont levels of Bacillus cereus and concluded that a probiotic concentration of 2 × 105 cells 100 g-1 was sufficient for enhanced growth performance, and that the use of a higher concentration of probiotic cells did not always yield significantly better results. This work was supported by the University Grants Commission, New Delhi, India in the form of Junior Research Fellowship to Ritu. Aly, S.M., Mohamed, M.F., John, G. (2008) Effect of probiotics on the survival, growth and challenge infection in Tilapia nilotica (Oreochromisniloticus)AquacultRes39, 647-656. Association of Official Analytical Chemists(AOAC) (1995) Official methods of analysis.Association of Official Analytical Chemists Incorporation. Arlington, USA p: 684. APHA (1998) Standard methods for the examination of water and waste water.20th edn. American Public Health Association, New York. Austin, B., Stuckey, L.F., Robertson, P.A.W., Effendi, I., Griffith, D.R.W. (1995) A probiotic strain of Vibrio algilolyticus effective in reducing disease caused by Aeromonassalmonicida, Vibrio anguillarum and Vibrio ordalii. J Fish Dis18, 93-96. Bandyopadhyay, P., Das Mohapatra, P.K. (2009) Effect of a probiotic bacterium Bacillus circulans PB7 in the formulated diets: on growth, nutritional quality and immunity of Catlacatla (Ham.). Fish PhysiolBiochem35, 467-478. Barry, T., Powell, R., Gannon, F. (1990) A general method for the development of DNA probes for micro-organisms. Nature Biotechnology 8, 233-236. Bernard, V.H., Nurhidayu, A., Ina- Salwany, M.Y., Abdelhadi Y. (2012) Bacillus cereus; JAQ4 strain as a potential probiotic for red tilapia; Oreochromis species. Asian J Anim Vet Adv8, 395-400. Berwick, V., Cheek, L., Ball, J. (2004)Statistics review 12: Survival analysis. Crit Care 2,389-394. Bhatnagar, A., Lamba, R. (2015) Antimicrobial ability and growth promoting effects of feed supplemented probiotic bacterium isolated from gut microflora of Cirrhinusmrigala. J IntegrAgr14, 583-592. Bhatnagar, A., Raparia S. (2014) Optimum dietary inclusion level of Bacillus coagulans for growth and digestibility improvement for Catlacatla (Hamilton). International J current res and rev6, 1-10. Bhatnagar, A.,Raparia, S., Kumari, S. (2012) Isolation and Influence of Bacillus coagulans CC1 on growth performance and digestive enzyme activites of Catlacatla. J Nature Sci and Sustainable Technol6, 237-253. Boris, S., Suarez, J.E., Barbes, C. (1997) Characterization of the aggregation promoting factor from Lactobacillus gasseri, a vaginal isolate. J Applied Microbiol83, 413-420. Cho, C.Y., Slinger, S.J., Bayley, H.S. (1982) Bioenergetics of salmonids fishes: energy intake, expenditure and productivity. Comparative BiochemPhysiol73, 25-41. Collado, M.C. (2007) Indigenous dadih lactic acid bacteria: cell-surface properties and interactions with pathogens. J Food Science 72, 89-93. Conway, P.L., Gorbach, S., Goldin, B.R. (1987) Survival of lactic acid bacteria in the human stomach and adhesion to intestinal cell. J Dairy Sci70, 1-12. Donnet-Hughes, A., Rochat, F., Serrant, P. (1999) Modulation of nonspecific mechanisms of defense by lactic acid bacteria: effective dose. J Dairy Sci82, 863-869. Duc, L.H., Hong, H.A., Barbosa, T.M., Henriques, A.O., Cutting, S.M. (2004) Characterization of Bacillus probiotics available for human use. Appl Environment Microbiol70, 2161-2171. Ehrmann, M.A., Kurzak, P., Bauer, J., Vogel R.F. (2002) Characterization of lactobacilli towards their use as probiotic adjucts in poultry. J ApplMicrobiol92, 966-975. Ellis, A.E. (1988) Fish Vaccination. Academic Press, London. FAO (2002) Antibiotics residue in aquaculture products. In: The State of World Fisheries and Aquaculture, Rome, Italy. Fuller, R. (1992) Probiotic the scientific basis.Chapman & Hall, London p: 398. Furukawa, A., Tuskahara H. (1966)On the acid digestion method for determination of chromic oxide as an indicator substance in the study of digestibility in fish. Bulletin of the Japanese Society for the Science of Fish 32, 502-506. Ghosh, K., Sen, S.K., Ray, A.K. (2003) Supplementation of an isolated fish gut bacterium, Bacillus circulans, in formulated diets for rohu, Labeorohita fingerlings. Isr J Aquacult-Bamid55, 13-21. Ghosh, S., Sinha, A., Sahu, C. (2007).Isolation of putative probionts from the intestine of Indian Major Carps.Isr J Aquacult-Bamid59, 127-132. Gilliland, S.E., Staley, T.E., Bush, L.J. (1984) Importance of bile tolerance of Lactobacillus acidophilus strains for use as dietary adjunct. Int J Food Microbiol29, 105-109. Handley, P.S., Harty, D.W.S., Wyatt, J.F., Brown, C.R., Doran, J.P., Gibbs, A.C.C. (1987) A comparison of the adhesion, coaggregation and cell-surface hydrophobicity properties of fibrilar and fimbriate strains of Streptococcus salivarius.J Gen Microbiol133, 3207-3217. Hassanzadazar, H., Ehsani, A., Mardani, K., Hesari J. (2012) Investigation of antibacterial, acid and bile tolerance properties of lactobacilli isolated from Koozeh cheese. Veterinary Res Forum 3, 181-185. Holzapfel, W.H., Haberer, P., Snel, J., Schillinger, U., Huisin’t Veld, J.H.J. (1998) Overview of gut flora and probiotics.Int J Food Microbiol41, 85-101. Hong. H.A., Duc. L.H., Cutting, S.M. (2005)The use of bacterial spore formers as probiotics. FEMS Microbiol Rev29, 813-835. Kishi, A., Uno, K., Matsubara,Y. (l996) Effect of the oral administration of Lactobacillus brevissubspcoagulans on interferon alpha producing capacity in humans. JAmCollNutr15, 408-412. Klaenhammer, T.R., Kullen, M.J. (1999) Selection and design of probiotics.Int J Food Microbiol50, 45-57. Kos, B., Soskovic, J., Vukovic, S., Simpraga, S., Frece, J., Matosic, S. (2003) Adhesion and aggregation ability of probiotic strain Lactobacillus acidophilus M92. J ApplMicrobiol94, 981-987. Kumar, R., Mukherjee, S.C., Ranjan, R., Nayak S.K. (2008) Enhanced innate immune parameters in Labeorohita (Ham.) following oral administration of Bacillus subtilis.Fish and Shellfish Immunolo24,168-172. Lalloo, R., Ramchuran, S., Ramduth, D., Gorgens, J., Gardiner, N. (2007) Isolation and selection of Bacillus spp. as potential biological agents for enhancement of water quality in culture of ornamental fish. J ApplMicrobiol 103, 1471-1479. Li, P., Gatlin, D.M. (2005) Evaluation of the prebiotic GroBiotic®-A and brewer’s yeast as dietary supplements for sub-adult hybrid striped bass (Moronechrysops x M. saxatilis) challenged in situ with Mycobacterium marinum. Aquacult248, 197-205. Moreira de Souza, D., Martins, G.B., Piedras, S.R.N., Pouey, J.L.O.F., Robaldo, R.B et al. (2012) Probiotic actions of Bacillus cereus var. toyoi and Saccharomyces boulardii in silver catfish (Rhamdiaquelen) larvae culture. RevistaBrasileria de Zootecnia41, 815-819. Moriarty, D.J.W. (1996) Microbial biotechnology: a key ingredient for sustainable aquaculture. InfoFish International 4, 29-33. Nayak, S.K., Swain, P., Mukherjee, S.C. (2007) Effect of dietary supplementation of probiotic and vitamin C on the immune response of Indian major carp, Labeorohita (Ham.). Fish and Shellfish Immunology 23, 892-896. Nikoskelainen, S., Ouwehand, A., Salminen, S., Bylund, G. (2001) Protection of rainbow trout (Oncorhynchusmykiss) from furunculosis by Lactobacillus rhamnosus. Aquaculture 198, 229-236. Panigrahi, A., Puangkaew, J., Kobayashi, T., Satoh, S., Sugita, H. (2005)The viability of probiotic bacteria as a factor influencing the immune response in rainbow trout Oncorhynchusmykiss. Aquaculture 243, 241-254. Pennacchia, C., Ercolini, D., Blaiotta, G., Pepe, O., Mauriello, G., Villani, F. (2004) Selection of Lactobacillus strains from fermented sausages for their potential use as probiotics. Meat Science 67, 309-317. Phillips, A.M. (1969) Nutrition, digestion and energy utilization. In: Hoar, W.S., Randall, D.J. (Eds.) Fish Physiology, Academic Press, New York 1, 391-432. Raparia, S., Bhatnagar A. (2016).Effect of dietary protein source and probiotic inclusion on pattern of excretion of ammonia and orthophosphate in holding water in Catlacatla culture system. International Journal of Fisheries and Aquatic Studies 4, 1-7. Re, D.B., Sgorbati, B., Miglioli, M., Palenzona, D. (2000) Adhesion, autoaggregation and hydrophobicity of 13 strains of Bifidobacteriumlongum. Letters in Applied Microbiology 31, 438-442. Sadasivam, S., Manickam, A. (1996) Biochemical methods, New Age International Publishers, New Delhi, India. Sahoo, P.K., Mukherjee, S.C., Sahoo, S.K. (1998)Aeromonashydrophila versus Edwardsiellatarda: a pathoanatomical study in Clariasbatrachus. Journal of Aquaculture 6, 57-66. 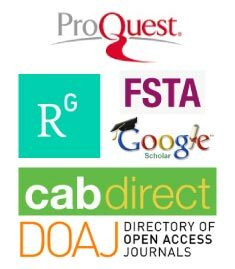 Sansawat, A., Thirabunyanon, M. (2009) Anti-Aeromonashydrophila activity and characterisation of novel probiotic strains of Bacillus subtilis isolated from the gastrointestinal tract of giant freshwater prawns.Maejo International Journal of Science and Technology 3, 77-87. Savage, D.C. (1992) Growth phase, cellular hydrophobicity, and adhesion in vitro of lactobacilli colonizing the keratinizing gastric epithelium in the mouse. Applied and Environmental Microbiology 58, 1992-1995. Sawhney, S.K., Singh, R. (2000) Introductory Practical Biochemistry. Narosa Publishing House, p:452. Schrezenmeir, J., De Vrese, M. (2001) Probiotics, prebiotics, and synbiotics—approaching a definition. American Journal of Clinical Nutrition 73, 361-364. Smit, G., Stacey, G. (1990) Adhesion of bacteria to plant cells: role of specific interactions versus hydrophobicity, In: Rosenberg, M., Doyle, R.J.(Eds.) Microbial Cell-Surface Hydrophobicity, American Society for Microbiology, Washington, DC, pp: 179-209. Soleimani, N.A. (2010) Antagonistic activity of probiotic lactobacilli against Staphylococcus aureus isolated from bovine mastitis. African Journal of Microbiology Reserach44, 2169-2173. Steffens, W. (1989) Principles of fish nutrition. Chichester, NY: Horwood. Sumagaysay-Chavoso, N.S. (2003)Nitrogen and phosphorus digestibility and excretion of different size groups of milkfish (ChanoschanosForsskal) for formulated and natural food –based diets. Aquaculture Research 34, 407-418. Swain, S.K., Rangacharyulu, P.V., Sarkar, S., Das, K.M. (1996) Effect of a probiotic supplementation on growth, nutrient utilization and carcass composition in mrigal fry. Aquaculture 4, 29-35. Tewary, A., Bidhan, P.C. (2011) Oral administration of baker’s yeast (Saccharomyces cerevisiae) acts as a growth promoter and immunomodulator in Labeorohita (Ham.). Aquaculture research and development 2, 1-7. Ueberschär, B. (1993) Measurement of proteolytic enzyme activity: significance and application in larval fish research. In: Walther, B.T., Fhyn, H.J. (Eds.) Physiological and biochemical aspects of fish development, University of Bergen, Norway. Tukey, J.W. (1977)Exploratory data analysis. Addison-Wesley, Reading, MA. Verschuere, L., Rombaut, G., Sorgeloos, P., Verstraete, W. (2000) Probiotic bacteria as biological agents in aquaculture. Microbiology and Molecular Biology Reviews 64, 655-671. Wadstrom, T., Andersson, K., Sydow, M., Axelsson, L., Lindgren, S., Gullmar, B. (1987) Surface properties of lactobacilli isolated from the small intestine of pigs. Journal of Bacteriology 62, 513-520. Walter, H.E. (1984). Probionases: Methods with haemoglobin, casein and azocoll as substrates, In: Bergmeyer, H.U. (Eds.) Methods of Enzymatic Analysis, Vol. V, Verlag Chemic, Weinheim, pp: 270-277. Wang, Y.B., Xu, Z.R., Xia, M.S. (2005) The effectiveness of commercial probiotics in Northern White Shrimp (Penaeusvannamei L.) ponds. Fisheries Science 71, 1034-1039.